It is Stella’s 5th birthday today and she wanted a horse cake. Hmm. A horse cake? Well, Hayley found a photo to work with, and I found an amazing cake recipe on “smittenkitchen”, so we were off to the races. A few hours later and I think we are all really happy with the results! Our original inspiration photo had more of a smooth finish, but we wanted this to look like the horse Stella rides – Artie. Pretty confetti sprinkles inside and it’s a perfect 5 year old birthday cake for a very special grand daughter. If you haven’t been to the Smitten Kitchen website yet, do yourself a favour and hop on over for a visit. Deb Perelman has great recipes, both her own and sourced from other cookbooks, they never fail. She calls this one confetti birthday cake, and it is easy to see why. Those little bursts of colour just make the cake look like a party already! So hard to believe Stella is 5 already! Even the bridle turned out really well! We were suitably impressed with how well Hayley created the mane. It’s working, this is looking pretty good! All right, sorry, enough of the horse cake photos, you are no doubt looking for the recipe! We just had so much fun creating it. One of the joys with this recipe is that you only use one bowl, and it takes about 5 minutes to put together. This time, I used 1 whole egg instead of egg whites, and used the batter for filling ice cream cone cups, they bake up perfectly into 9 hand held cake cones. Gently fold in the sprinkles. Preheat oven: To 350 degrees F. Line the bottom of an 8×8-inch square or 9-inch round cake pan with parchment paper and coat the bottom and sides with nonstick spray or butter. Make cake: Beat butter, sugar, and salt together in a medium bowl. Add egg whites, one at a time, beating until combined and slightly fluffy. Add vanilla and buttermilk and beat to combine. The mixture will instantly look like cottage cheese and you will be sure it’s ruined but I promise it is not. Add baking powder and cornstarch and beat very well to combine. Scrape down sides of bowl and beat one second more. Add flour and mix just until it disappears. Use a rubber scraper to gently fold in sprinkles. It’s definitely a help to have a baker as cute as this 5 year old. Bake cake: Spread batter in prepared pan and smooth the top. Bake for 20 minutes, or until a toothpick inserted into the center of the cake comes out batter-free. Let cool in pan on cooling rack for 5 minutes, then run a knife around the side to loosen the cake, flip it out onto the cooling rack, and slide the cooling rack into the freezer until cake is cool, about 10 to 15 minutes. I used a whole egg for these instead of egg white, just because I wasn’t really concerned about pure white batter. Simply stand the empty cones in a muffin tin and scoop in the batter. Bake for 18-20 minutes at 350. Look at them puffing up so nicely in the cones – kids love these and they are perfect for a birthday party. All baked up and ready to be topped with either icing or ice cream, a hit with the kids either way. Everybody needs a basic white cake in their wheelhouse, and this is mine. Double it for a layered cake, or keep it simple – either way it is moist and delicious. Basic white cake, today with a layer of fresh strawberries baked into the middle of the cake and served with softly whipped cream. Grease and flour a 9×9 inch pan or line a muffin pan with paper liners. Combine flour and baking powder, add to the creamed mixture alternately with the milk until batter is smooth. Scoop batter into the prepared pan. 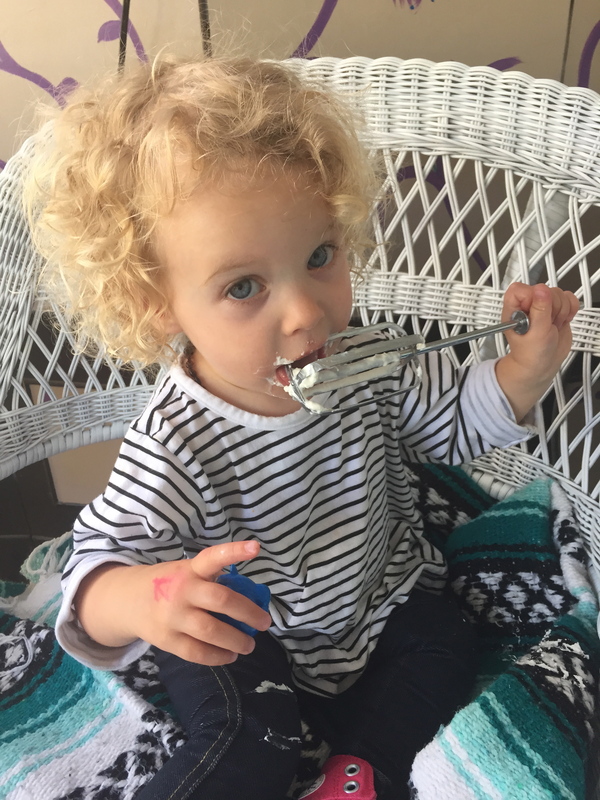 This might just be sweet little Stella’s first whipped cream beater to lick …. but shhhh – don’t tell anyone, Mom and Dad are away! 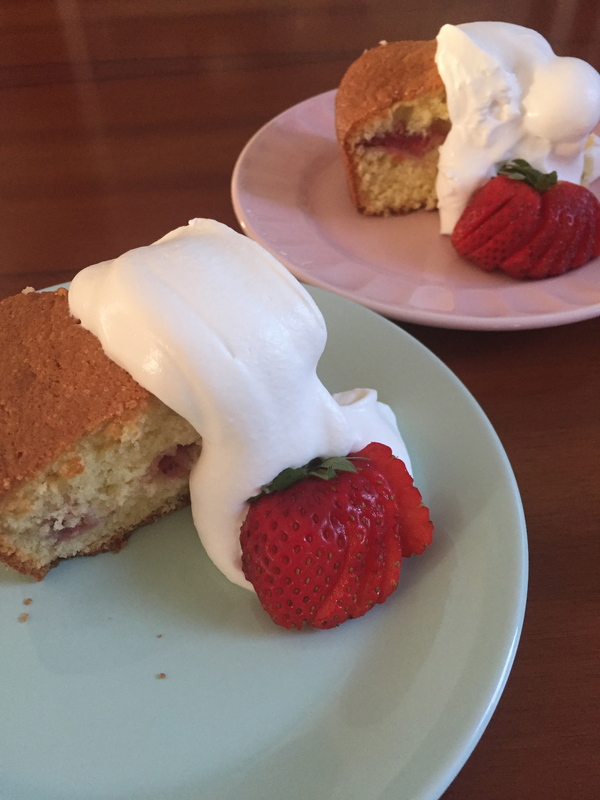 This cake is so versatile – tonight I spooned half the batter into the pan, covered with sliced strawberries and then covered those berries with the remaining batter.